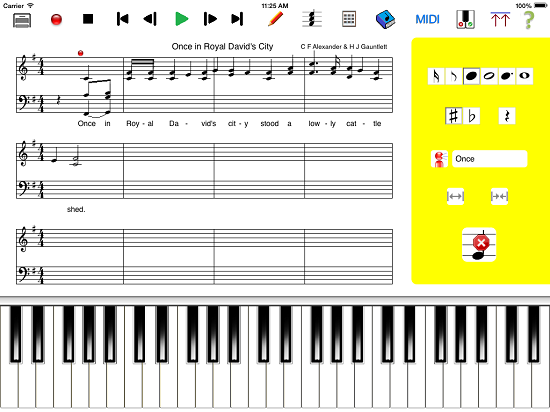 The MusicWriter iPad app is a great tool for those wanting to learn how to read and write music, for all ages. It is great fun to use and will enable anyone to create great musical compositions or songs within a very short time. The results can then be either printed(requires an AirPrint compatible printer) or emailed to yourself as a neat, A4 size, PDF document attached to the email. Half notes can be annotated as Sharp or Flat notes. Any point within the composition can be selected by tapping the section on the music, then time or notes can be inserted or deleted as required, until the required timing of the piece is attained. The music can then be played back, sounding like a piano, as required in order to listen to the results. Composers of all ages may well find the MusicWriter app an amazingly useful tool for putting down new songs when on the move, with the iPad being the only tool required/available. The music can have music note indicators, if required, when learning music, or not. The composition name and composer can be added for a professional looking finish. Once you have your music created you can test your musical knowledge with the Accuracy Test, which give a percentage accuracy score once completed.